Operators: Artseulov O., Kopalin V., Maksimov L.
The film is about a meeting concerning security and cooperation in Europe held in the city of Helsinki. Streets of Helsinki. National flags of countries - participants of the Conference on Security and Cooperation in Europe. Arrival of the Soviet delegation, headed by Leonid Brezhnev at Helsinki railway station, where she meets Finnish President Kekkonen. The building of the palace "Finland", in which the meeting is held. Meeting in cars drove up to the building of the palace. The participants in the meeting room. Speaker is the President of the Republic of Finland, Kekkonen (synchronously), the Secretary General of the United Nations, Kurt Waldheim, the British Prime Minister Harold Wilson (synchronously), Federal Chancellor Helmut Schmidt (synchronously), French President Jacques d'Estaing (synchronously), chairman of the National Defense Council of East Germany Erich Honecker (synchronously), Leonid Brezhnev (synchronously), the president of Czechoslovakia Gustav Husak (synchronously), U.S. President D. Ford and others. Heads of States signed the Final Act. Canadian Prime Minister Trudeau (synchronous), first secretary of the Bulgarian Communist Party T. Zhivkov (synchronous), first secretary of the Hungarian Communist Party Ya Kadar (synchronous) give an interview on the sidelines. Press Center Meeting at the Hotel Marcy. 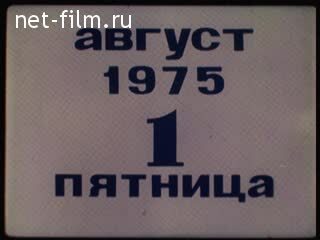 The film features newsreels of World War I, the signing of the Treaty of Versailles, the fighting of World War II, Auschwitz concentration camp, anti-war demonstrations, meetings of the World Congress of Peace, Soviet-French, and Soviet-American negotiations, the Olympic games, the joint flight of Soyuz-19 and the American Apollo and others. A hall of the palace "Finland". Participants of Meeting on security and cooperation in the Europe U.Kekkonen (Finland), Leonid Brezhnev, I.Broz Tito (Socialist Federative Republic of Yugoslavia), Schmidt (Germany), E.Honekker (GDR), D.Ford (USA), Makarios (Chyprus) and others are at the table. Flags of the different countries - participants of Meeting -are in streets Helsinki. Panorama of people in the streets. Grand welcome of the Soviet delegation in structure of: the Secretary general of the Central Committee of the CPSU [Communist Party of the Soviet Union] Leonid Brezhnev, Minister for Foreign Affairs of the USSR A.A.Gromyko, a member of the Central Committee of the CPSU K.U.Chernenko, the deputy minister of foreign affairs of the USSR A.G.Kovalev. Leonid Brezhnev is welcomed by the President of Finland Urho Kalevi Kekonnen. They are photographed by correspondents. Residents of Helsinki welcome the Soviet delegation. Cars pass, approach on a building of a palace "Finland". The Gander, Makarios, Leonid Brezhnev, A.A.Gromyko and other participants of meeting leave theirs cars. Leonid Brezhnev, E.Honekker, N.Chaushesku and others are in a lobby of meeting. The beginning of work of the final stage of meeting: U.K.Kekkonen acts. Panorama of people in the street examining portraits of participants of Meeting. Memorial board on the house where V.I.Lenin lived . Youth in the street - they talk, draw. The Soviet ship "Michael Kalinin" is in port. The ships are in port. The cars of participants of Meeting on security pass through. Building of a palace "Finland". Act: the general secretary of United Nations Kurt Valdhajm, the prime minister of the Great Britain Harold Wilson; the president of France Valeri Zhiskar d ´ Esten; the federal chancellor of Germany Helmut Schmidt; the first secretary of Central Committee SEPG Erih Honekker; the president of USA Jerald Ford and other orators. Guns shoot, tanks go, soldiers in an entrenchment, in gas masks, explosions; the small child put on a gas mask; soldiers on the square. Cars approach, they are left by participants of signing of the Versailles contract; signing of the contract (1919), pages with signatures are looked through. 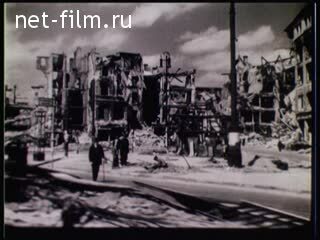 Newsreel of the Second World War. Fascists stand, torch procession of fascists, a torch burns. People welcomes the prime minister of England N.Chemberlen; N.Chemberlen leaves the plane, acts, shows to people the Munich contract (1938); military planes fly, houses fall; German tanks stand and go; soldiers run; explosions. The Soviet soldier gives the command; guns shoot; anti-aircraft gun; soldiers throw grenade, shoot, charge guns. Shooting in the street cities. 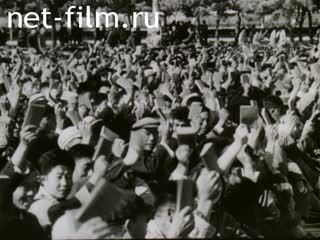 There pass the Soviet soldiers; people welcomes. Meeting on Elba Soviet and American soldiers; soldiers pass, greet, handshakes. Post-war newsreel : Children are taken out from a concentration camp. The Secretary general of the Central Committee of the CPSU Leonid Brezhnev acts. Panorama of listening E.Gerek and others in a hall. Correspondents photograph, write down, speak by phones. Meeting and demonstrations in the different countries, devoted to struggle for the world. Leonid Brezhnev's meeting with the chancellor of Germany of Century Brandt (Moscow), signing of the contract. 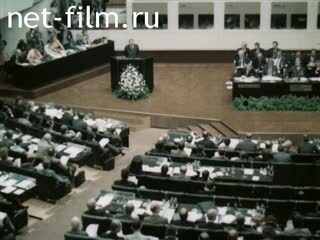 Newsreel 1973: Session of the World congress of peaceful forces in Moscow (1973). 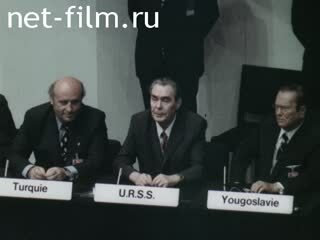 Leonid Brezhnev's meeting with Jiskar d´ Esten, signing of the contract (France?). Leonid Brezhnev and D.Ford's meeting in area of Vladivostok, negotiations. A.A.Gromyko and the ambassador of the USSR in the USA A.F.Dobrynin take part in negotiations. Leonid Brezhnev and D.Ford sign the contract. The participant of meeting in Helsinki the prime minister of Canada P.E.Trjudo gives interview in a lobby. 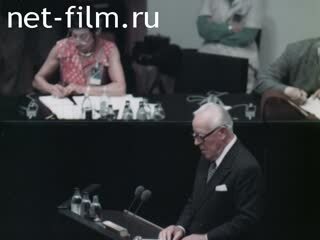 Leonid Brezhnev's meeting with U.Kekkonen, G.Wilson, Jiskar d´ Esten. Newsreel of different years: panorama of museum's building of the fine arts named in honour of Pushkin in Moscow. Panorama of one of museum's hall. Museum pictures “Dante and Vergily”, Degas's "Ballet". Assembly plans: tour performances of actors in the different countries; sculptures in park; Olympic competitions: public in stadium; sportsmen on finish - dance, embrace; falls weakened sportswoman; sportsmen on a pedestal of esteem. Scientists of the different countries on assembly of a spaceship; the scientist looks in a microscope. The Soviet astronauts A.Leonov and V. Kubasov in spacesuits; rise of a rocket; in the space center; photos of the American cosmonauts - participants of joint Soviet-American flight. A.Leonov and V. Kubasov are in space vehicle. Leonid Brezhnev's conversation with D.Ford, Kissindzher takes part in it. Leonid Brezhnev gives interview after conversation. Work of the press centre: journalists write, speak by phone, examine a film, take microphones; talk. The journalist has breakfast, another sleeps in an armchair. An interview in a lobby of meeting give: the First secretary of the Bulgarian Communist Party Todor Zhivkov, the First secretary of the Central Committee of the Hungarian Socialist Labor Party Janosh Kadar. From a tribune act: the Secretary general of Central Committee of the Communist Party of Czechoslovakia Gustav Gusak; the First secretary of Central Committee of the Polish Labor Party Edward Gerek. Meeting of heads of communistic and working parties in Yalta (1973). Leonid Brezhnev, T.Zhivkov, J.Kadar, E.Honneker, E.Gerek, the Gander acts. N.Chaushesku at meeting. Participants of meeting talk, and say goodbye. Assembly plans: the plane in air; passengers in the plane with the stewardess; the plane taxis up; passengers leave; the plane flies up. The sea; the steam-ship floats on the river; the reporting along the street of city. Neo-fascists burn a flag; demonstration of neo-fascists; they carry the poster with an inscription “say NO to Communism”. China - participants of meeting lift their quotation notes; demonstration - carry Mao Tse Tung's portraits. A photo: Chinese behind a lattice. Panorama of children in baby carriages. A panorama of a city street, people bear and carry their children in baby carriages. 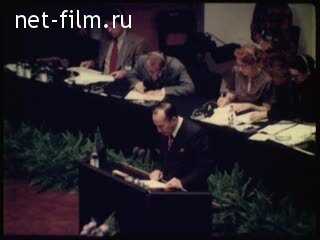 U.K.Kekkonen's meetings with Leonid Brezhnev, A.A.Gromyko; with a Wilson; D.Ford; Jiscar d ´ Esten. The car is left by A.A.Gromyko. The first stage of the meeting on security in Europe: U.K.Kekkonen is making a speech, A.A.Gromyko; participants listening. A panorama of the Palace of the Nations in Geneva. Participants of the Second stage of meeting behind their work. Signing of the Final act of meeting (on August, 1st, 1975); the signing persons: E.Honneker, D.Ford, Jiscar d ´ Esten; Wilson, E.Gerek, Leonid Brezhnev, I.B.Tito. The meetings, devoted to results of the All-European meeting at the Moscow factories “Kalibr” ["Caliber"], "Manometer" (mechanical engineering) and a trumpet factory (iron and steel industry): orators act, workers listen. Leonid Brezhnev, who has come back from Helsinki, goes down on a gangway of the plane. Leonid Brezhnev, A.N.Kosygin and others take place.